Whether you want a lower monthly payment, a faster repayment, or more time to pay, refinancing is often a good way to save money and simplify student loan repayment. Essentially, refinancing allows you to take out a new loan with new terms to pay off your existing student loan debt. Like many student loan refinancing lenders, Splash Financial can make it easier for you to pay off your debt by offering you a lower interest rate. However, Splash has some other unique offerings that make it a standout in this space. That’s especially true if you’re currently doing a medical residency or fellowship. Interested in learning more? Here’s what you need to know about Splash Financial. What are the benefits of refinancing through Splash Financial? 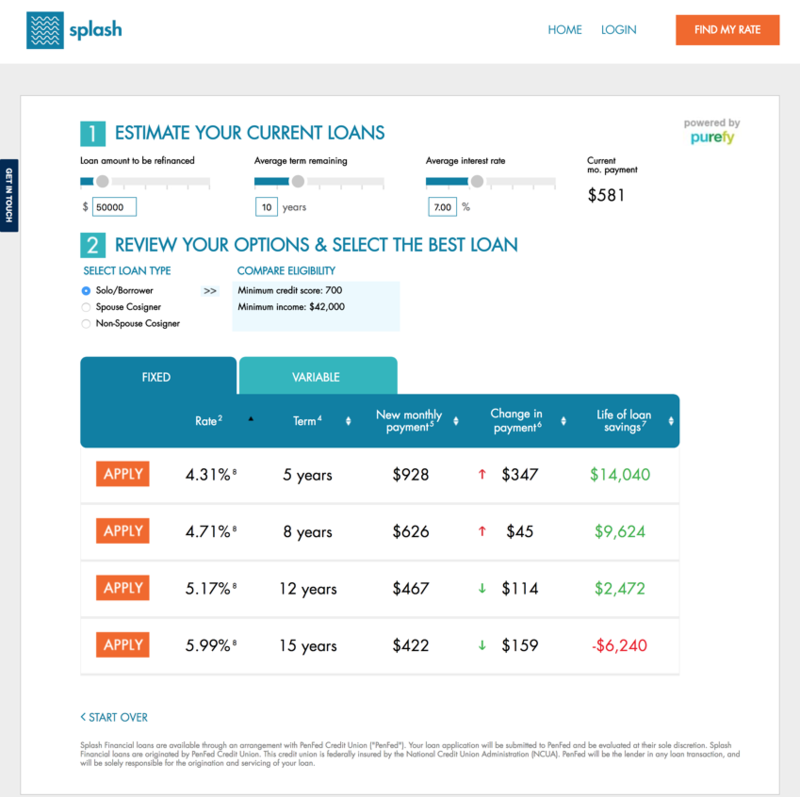 Splash connects you with community banks to give you access to market-leading student loan refinance deals. If that sounds overwhelming, know that Splash does the heavy lifting for you by negotiating with its partner banks and credit unions on your behalf. There’s only one application to fill out. You can get a conditional loan approval within minutes. Splash’s mission is to not only help you save money, but to help build financial literacy. 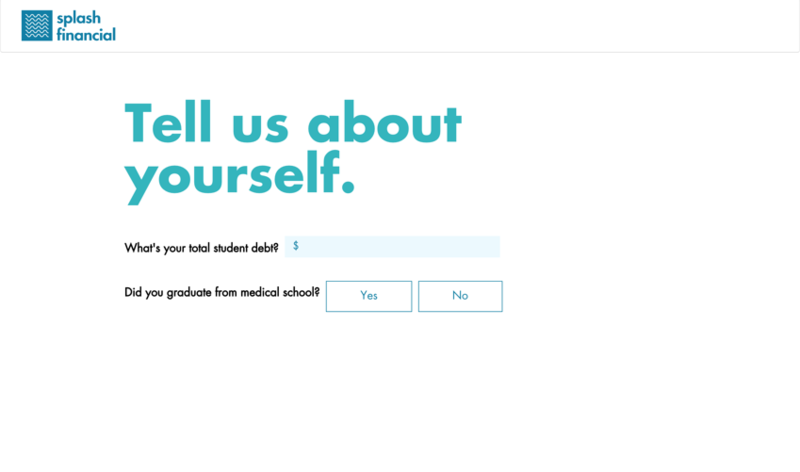 As part of that drive, the company provides free consultations in which you can discuss your unique student loan scenario. This service allows anyone get the help they need, whether you’re inquiring about an issue with the application or just shopping around for the best interest rate. You can arrange a consultation by email at splashfinancial@purefy.com or phone at 1-800-491-9310. If you’re in a medical residency or fellowship, Splash offers a specific refinancing plan to meet your needs so that student loans won’t distract you from your professional training. Splash also has a referral program that really pays off. When you refer a friend, you can earn $250 when that friend refinances with Splash. Why refinance through Splash Financial? Splash Financial’s founders created the company because they had friends who were drowning in student loan debt but didn’t know where to turn for help. This gave them the idea to start a company for people who were struggling with the burden of high student loan balances, high interest rates, and too-large monthly payments. Since those early years, Splash Financial has established itself as student loan refinance company that’s committed to lowering borrowers’ monthly payments and helping them pay off their debt sooner. What refinancing options does Splash Financial offer? With Splash Financial, you can expect low rates that will help you lower your monthly payments or pay off your loans faster. 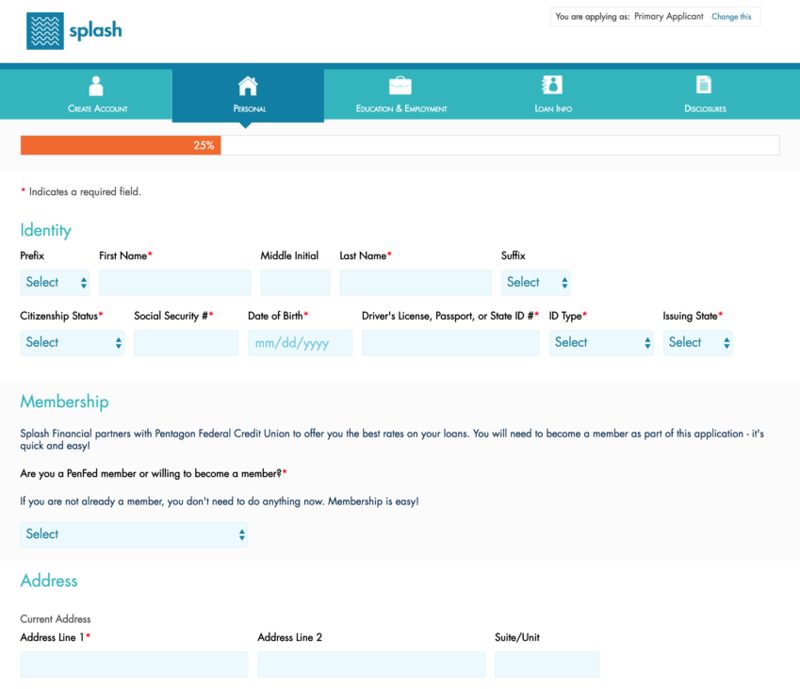 Splash customers say they typically save about $350 per month or $29,340 over the life of the loan. Fixed interest rates start at just 3.75% and variable interest rates at just 3.10%. You can refinance amounts anywhere from $7,500 to $350,000 at loan terms from five to 15 years. These options offer excellent flexibility, whether you’re on a tight budget month-to-month or you need to pay loans off in record time in order to save for long-term goals. Plus, keep in mind that lowering your interest rate by even 1% can save you thousands of dollars over the life of your loan, and shave months or years off your debt repayment. The company never charges origination or application fees, or penalties for paying your loan off early. So all of your hard-earned cash will go directly toward your debt. What refinancing options does Splash Financial offer for medical residents? Splash Financial understands that it can be hard to deal with student loan debt while doing a medical residency or fellowship. That’s why they offer low fixed rates, and no application or origination fees. Refinancing with Splash can reduce loan payments by $3,000 to $6,000 each year while you’re in training. Fixed interest rates start at just 3.75% and loan terms range from three to 20 years, offering you maximum flexibility. Borrowers can opt to pay just $1 per month for up to 84 months during training. This essentially defers payment until after your training is complete. However, be aware that opting for the $1/month payment means that all interest will accrue and capitalize at the end of your training period, so you’ll end up paying more in the long-term. But if making a significant student loan payment each month is simply out of the question while you’re in training, this could be a helpful option. Who qualifies for refinancing through Splash Financial? Be the age of majority in your state of residence. Have at least one outstanding, fully-disbursed private education loan, federal-backed education loan, or Parent Loan. Be the borrower on the loan application and on the promissory note. Have an annual income of $42,000 (or $25,000 with a cosigner who has an annual income of at least $42,000) for loans of up to $150,000. Have an annual income of $50,000 (or $25,000 with a cosigner who has an annual income of at least $50,000) for loans exceeding $150,000. Meet the borrower credit requirements. Refinance a loan amount of between $7,500 and $350,000. 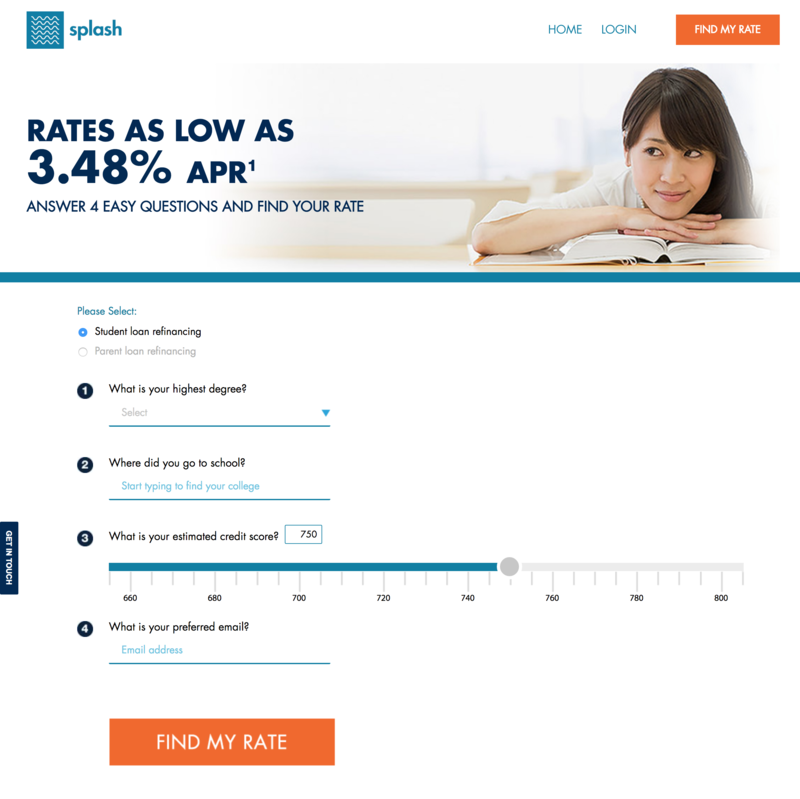 Splash Financial’s application process is quick and easy. Then, estimate the amount of student loans you’re looking to refinance, how much time you have left on them and your current interest rate. Splash will verify this information later, so it doesn’t have to be exact right now. You’ll also see some loan options and will be asked to choose which works best for you. This allows you to clearly see your interest rate, life of loan savings, and loan term before you apply. After you choose your preferred loan offer, you’ll be asked to create an account to finish the application process. Choose “New User” then create your profile. Now you’ll see the start of the application for the loan offering you’ve chosen. This asks for basic personal and loan information. In some situations, like for loan balances with a maximum limit of $300,000 and for non-residency and fellowship loans, you will need to become a Pentagon Federal Credit Union member. Splash has partnered with the credit union to fund these loans and give you the lowest-possible refinancing interest rates. Membership to PenFed Credit Union is free and easy. If your loan is financed through PenFed Credit Union, this is point in the application where you’ll be asked to become a member. You’ll also be asked about where you live and your education and employment history. After that, you will receive an conditional offer. Splash will give you all the details about how to submit verification documents. It’s that easy. Are you ready to refinance with Splash Financial? Whether you’re doing a medical residency and need to defer student loan payments, or a graduate who’s ready to lower your interest, it’s easy to see why Splash is good choice. To learn more about what the lender offers or apply for refinancing, visit SplashFinancial.com.